Female farmers play a vital role in African agriculture, accounting for 60 to 80 percent of the agricultural workforce. However, agricultural research and higher education are disproportionately led by men. There is an urgent need for a greater representation of women in the field of agricultural science and technology (S&T) in Sub-Saharan Africa. Female scientists, professors, and senior managers offer different insights and perspectives to help research institutes to more fully address the unique and pressing challenges of both female and male farmers in the region. Gender-disaggregated data on S&T capacity are scarce, often lack sufficient detail, and focus more generally on S&T rather than on agriculture specifically. Data are not always comparable due to different methodologies and coverage. The Agricultural Science and Technology Indicators (ASTI) initiative and the CGIAR Gender & Diversity (G&D) Program partnered together to address this information gap. 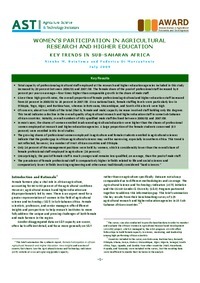 This brief summarizes the key results from their benchmarking survey of 125 agricultural research and higher education agencies in 15 Sub- Saharan African countries.